I ordered a new Planetbox lunchbox for Miss G. She is over the moon about her new box and owl carrying bag, and she’s anxious to pack her lunch in it again all by herself. Today’s lunches are vegan, gluten free and soy free (except the pretzels which contain wheat). I packed the first lunch for her in it. Clockwise from the top are slices of blood orange, Go Raw Pizza flax snacks, cashews, dried aprictos and dried cranberries. In the round stainless container is gluten free, vegan pesto macaroni in it with black olives and heirloom tomato slices. 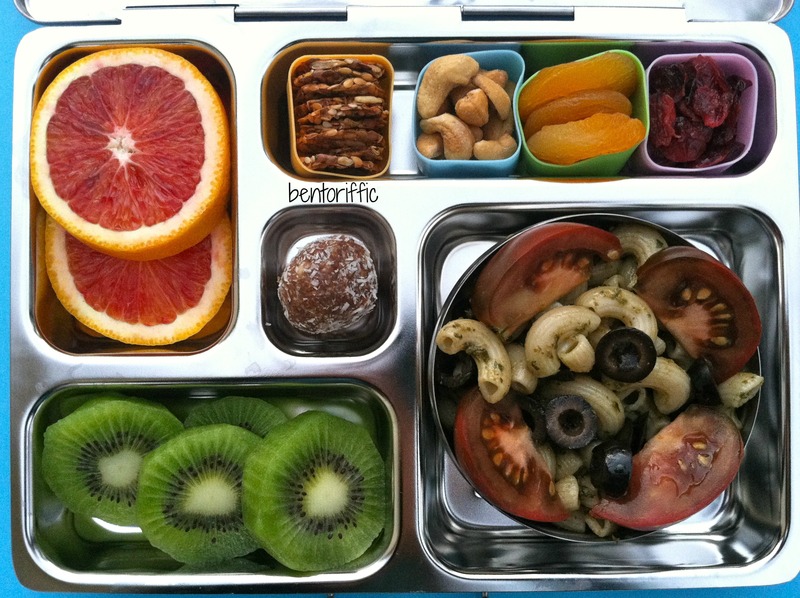 The bottom left compartment has sliced kiwi and in the middle is a coconut covered date and raisin “snow ball”. For her preschool snack today, Miss G has two small bento boxes. The top contains mini cucumbers from a local farm, and Trader Joe’s brand marcona almonds with rosemary. 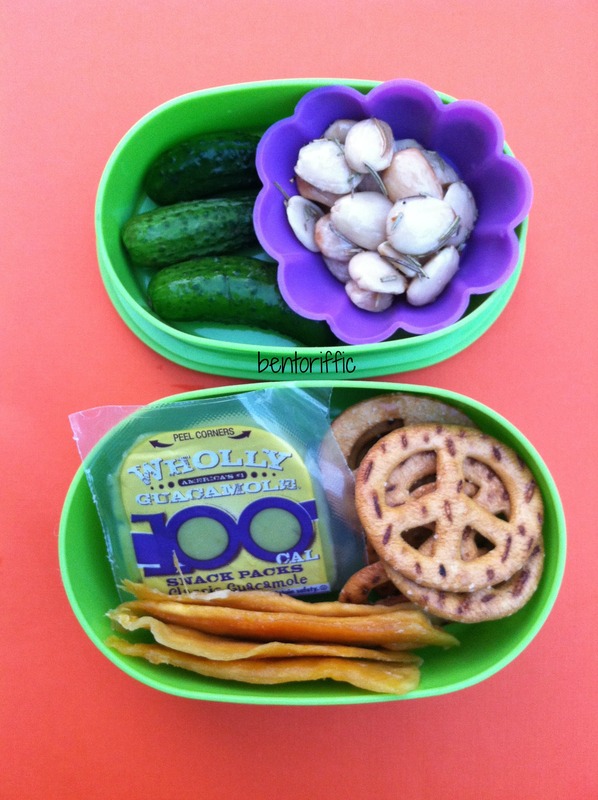 The bottom container has a Wholly Guacamole 100 calorie snack pack of guac with peace pretzel chips for dipping. At the bottom are dried mango slices. For Miss A’s toddler lunch, she has a LunchBots Quad stainless container. 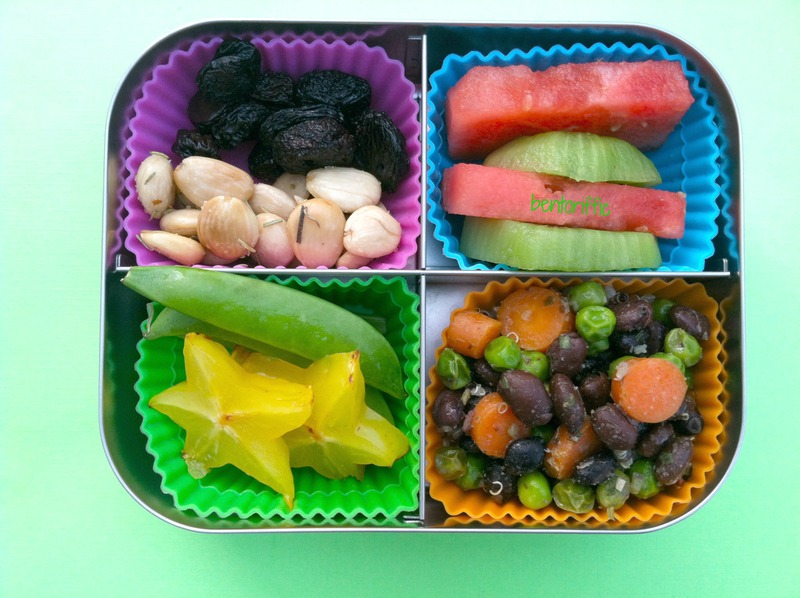 From the top left are dried cherries, rosemary roasted marcona almonds, kiwi and watermelon slices, quinoa topped with black beans, peas, carrots and shallots, and in the bottom left are carambola (star fruit) and sugar snap peas. 6 Responses to "Shiny new lunchbox"
Those colourful silicone cups in the Quad add such colour to her lunch! Both lunches look great. Nothing like a shiny new lunchbox to lift January back-to-school spirits even higher (probably yours more than Miss G) – thanks once again for Christmas in the New Year! You are welcome. Thank YOU for all your sweet comments! We do love the box. We have a bit of a bento craze in this house! Awww… I love the planetbox, may I know where did you order them? Pottery Barn Kids is where I got it, and go quickly because they’re on sale. I’ve never found them so inexpensively!